There is nothing more exciting for a foodie than scoring a reservation to a new, hot restaurant. You scour the menu days in advance plotting what you think you are going to order, you skim the latest reviews and pick out the right 'I-may-just-be-so-cool –that-I-eat-here-2x-a-week' outfit. Anticipating our last FoodiesInNYC trip to Lafayette made me feel giddy. It had been a while since the ladies got together, and going to Andrew Carmellini's (of The Dutch and Locanda Verde) new hot spot was the cherry on my sundae. The evening started with a reasonably priced, crisp and delicious bottle of rosé (reminiscent of the wine I drink on my recent honeymoon in St. Tropez) and a celebrity sighting - Serena Altschul of MTV and CBS Sunday Morning fame. Now, while Lafayette is French and NYC is having a French restaurant resurgence, this is no bistro. Ladies and gents, if you want escargots and steak frites, go somewhere else (like Les Halles). Lafayette is more subtle. 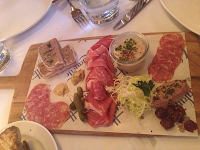 We started with the charcuterie which including homemade duck mousse, pate, and other cured meat delights. For $30, it was an unbelievable value and since we devoured it with thick, rustic bread, we were pretty full. Post-meat, we did the frisee salad with bacon maison and poached egg. I was in salty paradise. The bitterness of the frisee combined with the warm salty accompaniments was addicting. This was a highlight for me, but I was alone in my opinion. Anne and Christa weren't wowed. We then shared two spectacular pasta dishes - the evening’s special, which was a short rib and black truffle ravioli and Fleur de Soliel pasta which had a light cream sauce with peas. The pastas were done right. The ravioli was paper thin, but somehow still stood up to the short rib and the generous portion of truffles (which made us worried that we should have asked the dish's price before ordering! But don't fret, it was reasonably priced). While we all claimed we were too full for dessert (and quite upset about it as the dessert menu is outrageous), we stopped by the bakery in the front of the restaurant and picked up some macaroons for a late night snack. Try the pistachio with cherry filing – tre magnifique! Duck mousse, I think I love you.